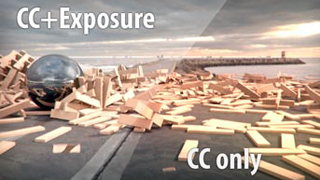 After Effects' Exposure control is a linear tool. It applies exposure multiplying the input image by a constant value, so it's useful to globally brighten or darken an image, but 3D artists usually think of exposure as a non linear control, aka a "tone mapper". This simple Pixel Bender filter allows to compress highlights with a non linear curve, based on the well known Reinhard's Tone Mapper described in "Photographic Tone Reproduction for Digital Images". It's easy to use, reasonably fast, and especially useful when applied to images produced with a linear workflow. And it's free. Global tone mapping operators mimics film's logarithmic response curve. In short, they compress superbright pixels without darkening the image. Have a look at how the blown-up clouds are toned down by the simple tone mapper in this rendered sequence, straight out of Lightwave 11. Hover with the mouse over the highlights and look at the values in After Effects info palette. The largest value should be the one used as White Level. From there, it's only a matter of adjusting and refining the value to achieve a good balance of dark and bright tones. If your image is gamma corrected, make sure to set the proper gamma value. Otherwise leave it at 1.0 (linear gamma). Don't forget to set the project's depth to 32bpc, otherwise banding will ruin the image. Here's the complete animation, a real quick render that uses just a direction light and a sky. Ninety percent of the final look is created by the Simple Tone Mapper plugin. The remaining ten percent is a bit of color correction — a blurred layer added to the original — used to create an halo around the highlights. This energy diffusion step is important to preserve the illusion of really bright spots in the images (as explained in "High Dynamic Range Imaging" by Reinhard, Ward et al.). BTW, "energy diffusion" is the fancy term for Fast Blur. The tone-mapping curve depends on the White Level adjustment, as shown by the sample curves for the tone mapper depicted below. The dashed line is a linear mapping: the image is not changed. As the White Level parameter increases, brightness that approaches the highlight range is compressed. The low dynamic range (LDR) brightest value, one, will always be mapped to the original image's brightness closest to the value selected in the White Level parameter. The Gamma control linearizes, if needed, the input image. Set it to 1, linear gamma, if you interpret After Effects footage with the "Preserve RGB" option. Set it to the current profile gamma (usually 2.2) to let the plugin linearize, then reapply, gamma correction. More accurate results can be obtained leaving the Gamma parameter to 1, and applying a Color Profile Converter after the simple tone mapper. Important: Tone Mapping and "Linear Workflow" are meant to work together and Tone Mapping should always be performed on the linear image. Afterwards, the tone mapped picture should be gamma corrected. Using a proper linear workflow does not mean we can skip the exposure adjustment (aka tonemap). The gamma correction is mandatory to adjust the monitor response curve, but the exposure step is just as important to produce pleasing images. Download the filter here: After Effects Tone Mapper. If you have never installed Adobe Pixel Bender filters before, please refer to Adobe's instructions to install Pixel Bender filters for After Effects. Otherwise, just copy the pbk file into your Pixel Bender folder and restart After Effects. The Simple Tone Mapper will be in the VFX Wizard menu group. in any After Effects and Premiere Pro version from CS4 to CC. Not working in CS6 ? is it broken these days as Pixel Bender is discontinued in CS6 ? Re: Not working in CS6 ? Yes, CS6 discontinued PixelBender filters, so it will only work on earlier versions. I have written a converter to allow PBK plugin kernels to be compiled into native AE and Premiere Pro plugins that also run on CS6 (as well as 32-bit hosts like AE CS4, Windows and Mac). And they run on the GPU now (Pixelbender in AE was always calculated on the CPU, therefore being rather slow). Tobias, that converter of yours is nothing short of amazing. I'v never used Pixel Bender much, mainly because its format did not fit commercial distribution (IIRC there was a long debate about this on "region of interest"). Your solution works very well, and injects new life in the bender toolkit. Thanks for taking the time to convert my simple tone mapper to a real plugin that works with CS6! ive seen the new pixel bender for cs6 but there is an alternative?